North Idaho College will present its “Sounds of Christmas” concert in Boswell Hall Schuler Performing Arts Center at 7:30 p.m. Saturday, Dec. 10, and at 2 p.m. Sunday, Dec. 11. The concert will feature performances by the NIC Wind Symphony, NIC Cardinal Chorale, and NIC Chamber Singers. This concert will feature the audience-favorite Christmas carol sing-along. The NIC Choirs Sounds of Christmas performance will feature works by Baroque masters Antonio Vivaldi and George Frederick Händel, as well as contemporary compositions and arrangements by John Rutter, Eric Whitacre, and Darmon Meader. “Domine fili unigenite” from Vivaldi’s Gloria and “And the Glory of the Lord” from Händel’s Messiah will highlight the set of music performed by the Cardinal Chorale. “Les Berceuse” (Lullaby) is a beautiful John Rutter arrangement of Barbara Bell’s French carol. The choir will conclude with “Silent Night for All the World” arranged by Pepper Chopin. This arrangement will feature the Franz Grüber’s carol sung in English, German, Korean, Spanish, and Zulu. North Idaho College Choral Union consists of the Cardinal Chorale and Chamber Singers. The Choral Union has a long tradition of performing moving performances for audiences in the Inland Northwest and beyond. Both choirs have traveled throughout the United States and North America. Recently members of both ensembles performed at Carnegie Hall in New York City. Choirs have also performed in Seattle, San Francisco, and Mexico. Members of the both choirs consist of NIC students, alumni, faculty and staff, as well as area community members. 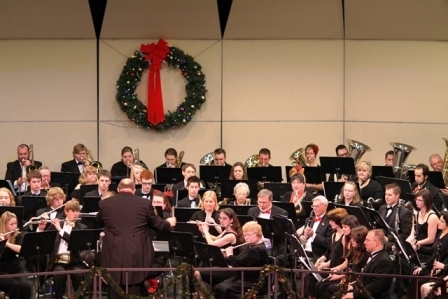 The North Idaho College Wind Symphony, conducted by Terry M.L. Jones, is a community group with over 2,000 years of playing experience. The multi-generational group blends high school students, college students and community members into one ensemble to create art and a 40-plus year tradition. The group is open to the public and meets one day a week during the college school year. As per tradition, the concert will end with the annual Sing-a-Long – a collection of holiday favorites arranged by local arranger/musician Tom Tucker.